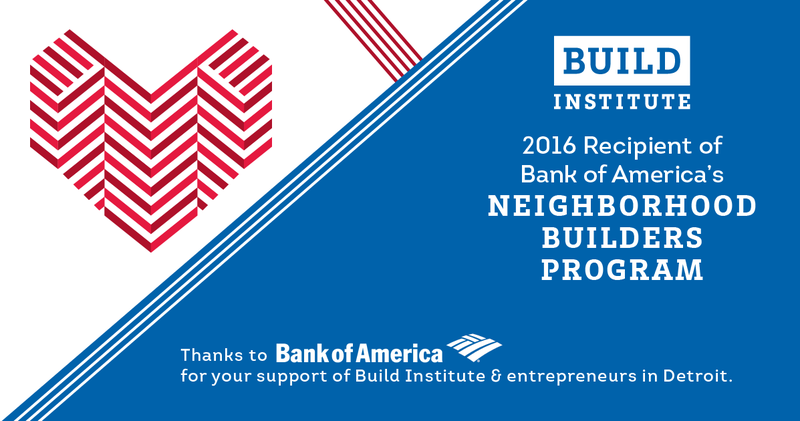 Build Institute is honored to be selected as a 2016 Neighborhood Builder from Bank of America. The recognition awards high-performing nonprofits that have made a significant impact in the community working in the bank’s priority funding areas of housing, jobs and hunger relief. The Neighborhood Builder program is a strategic investment that pairs leadership training with a $200,000 unrestricted grant over two years so leaders gain valuable skills while applying funding where it is most needed. For Build Institute, the funding will be used to build up the organization’s technical assistance program for entrepreneurs, allow for the hiring of an on-staff small business advisor to offer one-on-one consulting, and provide funds for its micro-lending program. Since 2004, through Neighborhood Builders, Bank of America has helped nonprofits create greater impact in their communities and better prepare for the future by providing the tools and resources they need to develop stronger strategic plans, chart a succession plan, navigate through tough economic times, and enhance their funding opportunities. Since the program’s inception, Bank of America has invested more than $180 million in 900 nonprofit organizations across the country, providing leadership resources to nearly 2,000 nonprofit leaders, and the program has been recognized as the nation’s largest philanthropic investment in nonprofit leadership development. Thank you Bank of America for your support of Build Institute and entrepreneurs in Detroit.